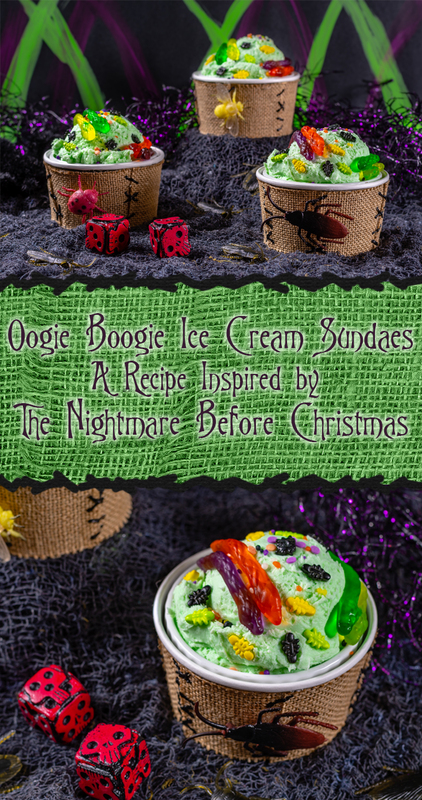 Our recipe for Oogie Boogie Ice Cream Sundaes is a Paid Promotion for Walt Disney Studios’ The Nightmare Before Christmas. Last week we shared a recipe inspired by one of our favorite Halloween themed movies, Hocus Pocus. Hocus Pocus is celebrating its 25th anniversary. Another one of our favorite Halloween films, The Nightmare Before Christmas, is celebrating its 25th anniversary as well! 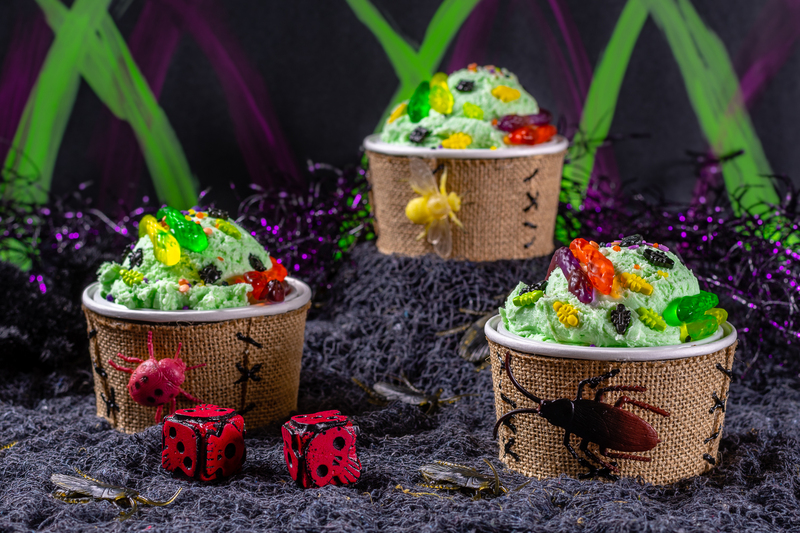 We’ve created a fun DIY/recipe, Oogie Boogie Ice Cream Sundaes, inspired by the film’s villain, Oogie Boogie! Song Selection – Shriek along with these ghoulish tunes from the movie, or just lend an ear if you find singing to be particularly ghastly. The Beginning – Tim Burton and the filmmakers detail the early stages of the beloved film. Music – Discover how composer and lyricist Danny Elfman expressed Tim Burton’s unique vision through the timeless songs heard in the film. Storyboards – In the storyboard phase, visual representations are first drawn for each scene and then put together in sequential order. Art Direction – From camera angles to miniature sets, just about every detail of the film was meticulously plotted by the filmmakers. Puppets – All of the characters’ puppet models are constructed in a process that takes them from their metal base to the final painted mold. Behemoth Singing – In this unused storyboard sequence, we learn there may have been more to Behemoth than the overalls let on. Oogie Boogie with Dancing Bugs – Unused because of its difficulty to animate—take a look at this storyboard sequence where Oogie Boogie cuts a rug with some bugs. Alternate Identity of Oogie Boogie – Although never used in the final film, Oogie Boogie was almost a mere alter ego for someone very close to Jack and Sally. Vampire Hockey Players – Tim Burton almost had quite the grotesque cameo, but he was replaced by a pumpkin in the final film. Lock, Shock, and Barrel – Lock, Shock and Barrel settle in for a front-row seat while Oogie Boogie terrorizes Santa and Sally. Oogie Boogie Shadow Dance – The Boogie Man was never one to shy away from the spotlight, as is evident in this deleted dance sequence. Tim Burton’s Early Film: “Frankenweenie” (Uncut Version) – Before Tim Burton gave us all nightmares, he created this electrifying short film that replaces Frankenstein’s monster with a dog. “What’s This?” Jack’s Haunted Mansion Tour – Take a ride through Jack’s Haunted Mansion Holiday and see how Disney Imagineers transformed an iconic Disneyland attraction. Tim Burton’s Original Poem Narrated by Christopher Lee – Hear Hollywood legend Christopher Lee narrate the poem that inspired the movie. Set over illustrations based on Tim Burton’s art. Storyboard-to-Film Comparison – See the final version of Jack’s Christmas pitch to the people of Halloween Town next to the original storyboards. Theatrical Trailer – In this theatrical trailer, enter a place where every day is Halloween—till Jack Skellington shares his unique view of Christmas! Teaser Trailer – This trailer highlights Disney’s long history with technology in filmmaking and heralds a new collaboration with Tim Burton. Tim Burton’s Early Film: “Vincent” – Vincent Price himself narrates this stop-motion tale of little Vincent Malloy and his fascination with the macabre. Posters – Take a look at some promotional posters from the movie’s release. We went about creating Oogie Boogie’s Ice Cream Sundae a bit differently than our normal recipes. Instead of focusing on the dish itself, we focused on how it would be served. We created these adorable Oogie Boogie cups complete with burlap and bugs! They are fairly easy and make a great party favor as well! 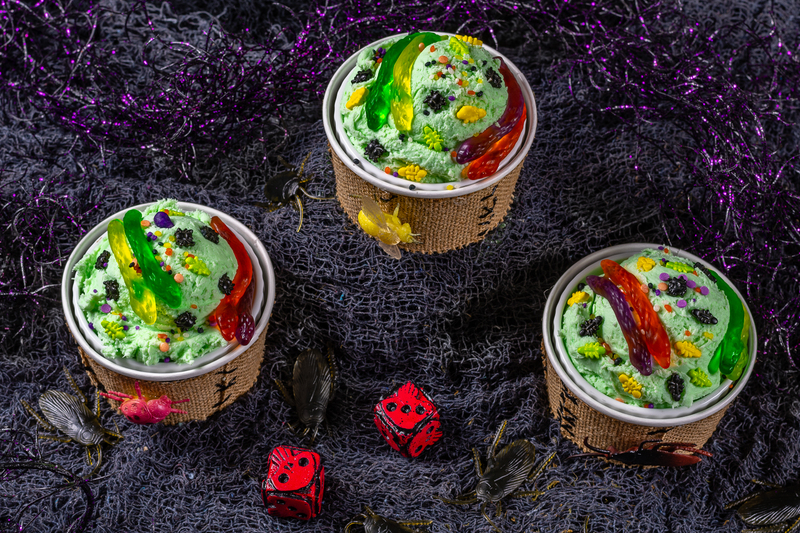 Add your favorite green ice cream, a few bug sprinkles, and gummy worms, and voila, party perfection! We hope you enjoy our DIY/recipe for Oogie Boogie Ice Cream Sundaes! Be sure to pick up your copy of The Nightmare Before Christmas, now available on Blu-ray/DVD and Digital HD! Do you consider The Nightmare Before Christmas a Halloween movie or a Christmas movie? Let us know in the comments below or tag us on social media using the hashtag #GeekEats! Happy October! *Bonus features may vary by retailer. 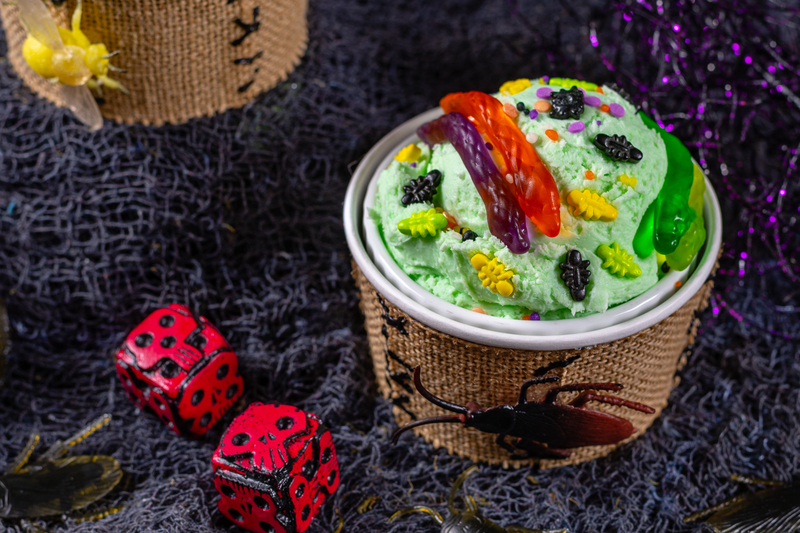 The Geeks are celebrating the 25th anniversary of The Nightmare Before Christmas with a cute craft and ice cream sundae DIY called Oogie Boogie Ice Cream Sundaes! Stick them to the cup using hot glue to secure the edges. [Optional] Paint with a thin coat of glow in the dark paint mixture and allow to dry. Using the puffy paint, make stitches on the lines there the burlap tape pieces end. Hot glue a plastic bug onto each cup. Scoop ½ cup – ¾ cup of ice cream into each cup. Top with desired amount of toppings. If you want to be able to reuse the cups or send them off as party favors you can use a second bowl or ramekin as an insert to keep the outer bowl clean. *This is a Paid Promotion for Walt Disney Studios’ The Nightmare Before Christmas. All opinions are wholly our own. View our Disclosure Policy for more info. These look really cool, but gummy worms and gummy bugs kinda freak me out.